Lately, I have watched some bad football. The Tennessee Titans leave a lot of be desired. The season of the Tennessee Volunteers has gone from great promise to a quagmire. I am also reading a book about an infamous game in the history of Cumberland University. For those who do not know, our school lost to Georgia Tech 222-0. It is the biggest defeat in the history of college football. Sam Hatcher, who I have known for years, wrote a book to commemorate the 100th anniversary of the game. 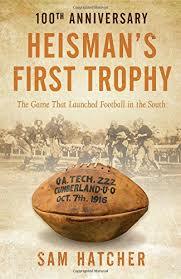 Heisman’s First Trophy: The Game that Launched Football in the South is an interesting read that provides a great story of the game. I would recommend it to anyone. Some of it is fictionalized, but the heart of the story remains true. I have been surrounded by bad football, but I have also witnessed some bad halftime performances. The University of Tennessee Marching Band is known as the Pride of the Southland, and they have been performing something called the “Circle Drill” for 50 years. I know that because they announced that this year is the 50th anniversary of the routine. Certainly, it is a difficult marching formation to perform, but I have one request. I have been watching the “Circle Drill” for 42 of the 50 years that it has been in existence, and they have played the same songs the entire time. I can even recite the announcer’s script. They do a musical tour of Tennessee by starting out in Memphis. That is when they play Elvis Presley’s “signature” tune “C.C. Rider.” Then, they go to Chattanooga with “Chattanooga Choo Choo.” Next is a visit to Nashville with “Will the Circle Be Unbroken.” They end up in Knoxville with “Rocky Top,” the school’s unofficial fight song. I understand “Rocky Top.” It fires up the crowd and needs to be played. However, it is time to spruce up the rest of the collection. Tennessee is one of the most musical places around. I know they can do better. First, “C.C. Rider” is not the “signature” song of Elvis Presley. I guarantee that if you ask anyone to name and Elvis song that one would not be mentioned. I would choose “Hound Dog.” Here is the other thing. Elvis was not the only creator of songs in Memphis. What about doing a Tina Turner songs? Or an Isaac Hayes song? What about a Blues classic or something from Stax Records? I know that “Chattanooga Choo Choo” is an obvious selection for Chattanooga. However, they could throw the crowd a curve with “Chattanooga City Limit Sign” by Johnny Cash. How about “Lookout Mountain” by Drive-By Truckers? Nashville, otherwise known as Music City, is home to hundreds of artists and thousands of songs. I think they can find a new one. “Nashville Cats” by The Lovin’ Spoonful would be a great pick. Heck, they could shock the world by playing a Jimi Hendrix tune. It would work since he spent his early days in the clubs on Nashville’s Jefferson Street. I cannot even do this paragraph justice. There are so many songs to play that they could close their eyes and pick one out of a songbook. Better yet, they could get the band from Tennessee State University to do the “Circle Drill.” I know the Aristocrat of Bands and the Sophisticated Ladies could circle it up.